Do you ever feel like leaving the house with toddlers takes more effort than writing your college thesis? I know. I have four littles and I have spent more time looking for shoes than it took to write all of my college papers combined. Fo Real. Now that you know I look for a lot of shoes, you also need to know I love food. I really love food and I want my kids to love food. I want them to know all about real food. For example, I want them to know that carrots come up from the ground with these little hairs covered in dirt. So what’s a real food-loving, shoe-seeking mom to do? 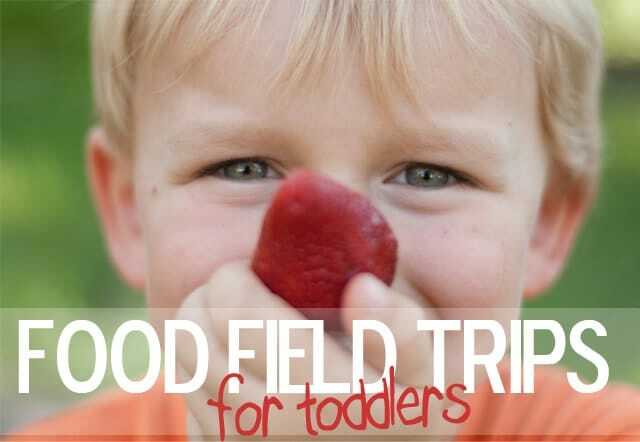 Here are some low-stress, low-prep Food Field Trips for you and your toddler or preschooler. Your best location is a nearby grocery store because your tyranical sweet toddler can handle that in an afternoon. Bonus: Your beautiful nerves will still be in tact at the end of the outing. Try some of these learning games and activities in the store. Treat it like an event and they will love it! Sports Fanatic. Is your family crazy for the Broncos? 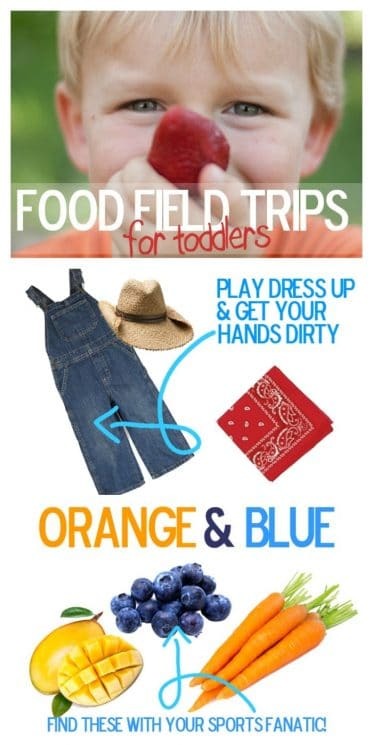 Invite your toddler to pick out orange and blue veggies. Let them carry it to the check out. 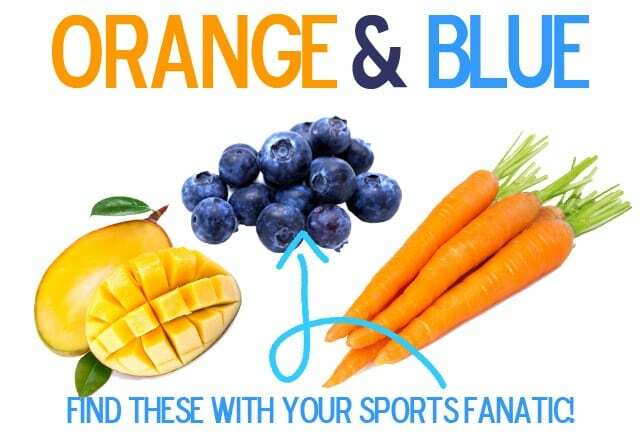 Work together to give appropriate names to the fruits and veggies after the mascot or favorite players. International Relations. Does your town have an international grocery store? Asian? Middle Eastern? My kids LOVE it when we go to large Asian grocery stores. They carry different veggies and fruits. Sometimes they even have live frogs, lobsters, and fish. I always invite them to pick out a new fruit or veggie to try. Rainbow Hunter. Invite them to attend a Rainbow Hunt with you. Drive to a grocery store or Farmer’s Market and try to find every color in the rainbow. Exaggerate with crazy excitement when you find each color. Discuss color, texture, and taste as you go. You might even hunt for the ingredients to this Rainbow Chicken Salad. Even if you grow zucchini in your very own dirt you can make a seriously fun outing in someone else’s dirt. It’s just like taking them to a friend’s house and they go gaga over the same exact toy they just destroyed with permanent marker because it was dumb at your house. Foodie Photographer. Arrange to visit a neighbor or friend with a garden. Bring an old phone with a camera or a dorky digital camera that your Little Foodie can operate. Invite your child to take pictures of the plants. Ask questions. Touch the dirt. Ask for samples. Afterwards, look through the pictures together. Ask your photographer if they want to make a simple recipe together with some of those plants. You may live close to a working farm, orchard, or greenhouse. Jump online and spend some time with Google. I discovered an enormous tomato greenhouse about ten miles from my house. My kids thought it was awesome. They even got to ride out on a dolly. We bought 20 pounds of tomatoes and went home and had a tomato feast. Play Dress Up. 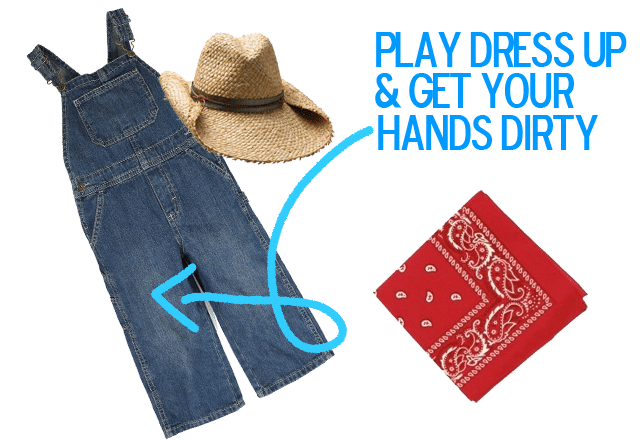 Dig around your costume box and find something that resembles a farmer’s outfit. Kids love to dress up. The staff at the green house or farm will seriously compliment your Little Foodie. Call ahead and ask if you and your child can have a short tour. Make sure you have loads of dialogue about how they grow ______ (potatoes, peas, carrots, peaches, etc.). 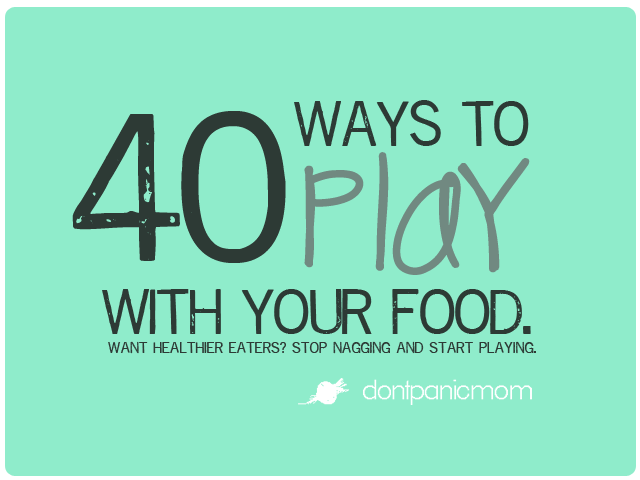 My most important food advice for any mom with toddlers: Don’t Panic. Teach about food with a smile (preferably with carrots in your teeth). Don’t let something so enjoyable become a battlefield. Now it’s time to locate some shoes and get out the door! Enjoy these field trips with your favorite short people! Pssst. Here’s one of my all-time most shared post about playing with food. Stop nagging and start playing with just one little click.